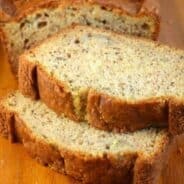 Enjoy a slice of this incredibly sweet and moist Lemon Zucchini Bread for breakfast, brunch or as an evening treat! It won’t disappoint! So….welcome to August! 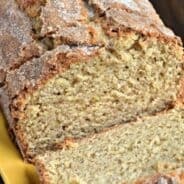 I have FOUR zucchini bread recipes waiting to share with all of you. 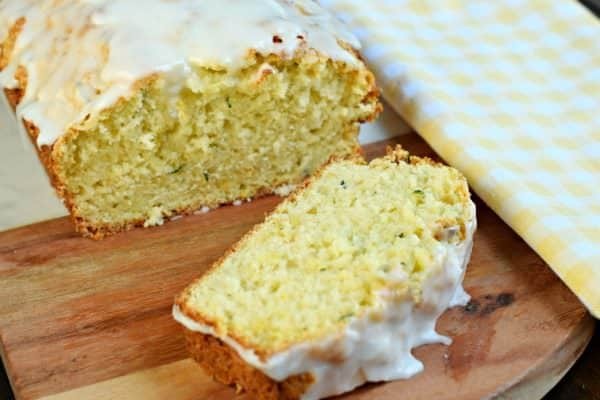 But I thought I would start with today’s LEMON Zucchini Bread since it’s truly one of my favorites. If you know me at all, you’ll know I am a sucker for all things lemon flavored. These Lemon Cheesecake Bars are hands down in my top 10 favorite recipes…and they’re quite popular with you, my readers, as well! But, let’s talk about zucchini. Every year as I plant my garden I think about how many zucchini plants should I do? In our current yard, we have a much smaller garden area than I’m used to, so I have to be deliberate about how many things to plant. I can’t get all crazy and plant arugula in the hopes that I’ll use it and eat it. Last year I planted three zucchini plants and they EXPLODED. Like, legit, we were eating SO MUCH ZUCCHINI. I froze well over a dozen loaves of zucchini bread, I made zucchini cake, and another zucchini cake, zucchini muffins, and even zucchini brownies. This year I thought maybe I should only plant TWO plants…but then I panicked. What if ONE gets bugs and dies? I can’t survive on just ONE zucchini plant. That is not nearly enough zucchini for all the recipes in my head. So. I planted three again. And once again, we are OVERWHELMED with zucchini. 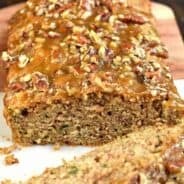 In a good way though because not only do I have 4 zucchini bread recipes (coming soon)…but I have a savory zucchini recipe that I can’t wait to share. Stay tuned…sign up for my email so you don’t miss a new recipe! 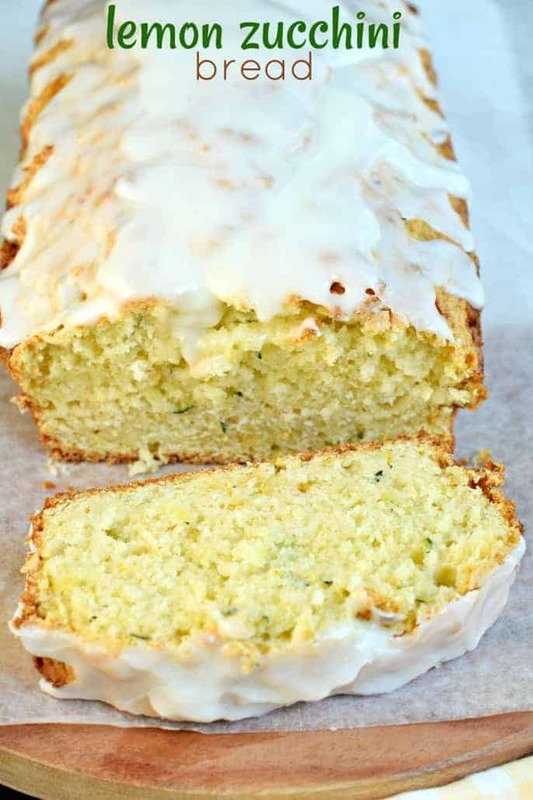 But let’s talk about today’s Lemon Zucchini Bread. This isn’t as lemony as my Starbuck’s Lemon Loaf. However, it has the perfect amount of citrus to give it a kick of lemon flavor. 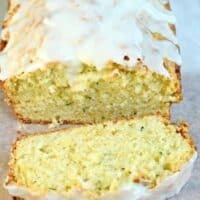 You could even add poppy seeds to make it a Lemon Poppy Seed Zucchini Bread (or try these Lemon Poppy Seed Zucchini Muffins)! Whenever I make quick bread I always try to make sure it makes TWO loaves. I mean, if you’re going to turn on the oven and go through the process of mixing up some ingredients, you might as well get a second loaf, right? And, as usual, these are great to wrap up in foil, place in a ziploc freezer bag and freeze until you’re ready to enjoy!!!! 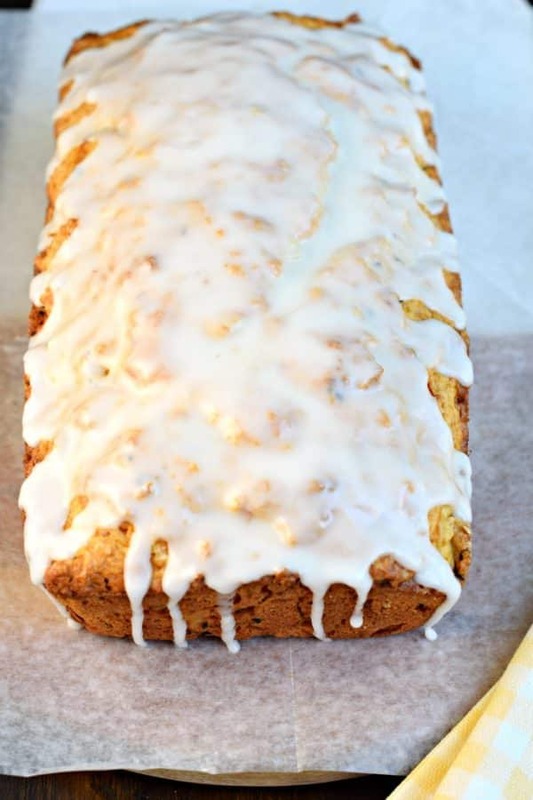 Enjoy a slice of this incredibly sweet and moist Lemon Zucchini Bread for breakfast, brunch or as an evening treat! It won't disappoint! Preheat oven to 350 degrees F. Line bottom only of two 9-inch loaf pans with parchment paper or spray with baking spray. Set aside. In a large bowl, mix all ingredients for bread, stirring to completely combined. Pour into greased pans and bake for 60 minutes, until completely cooked. Allow to cool for 10 minutes in pan, remove from pan and cool completely. For glaze, whisk together powdered sugar with lemon juice until smooth. Drizzle over bread. I enjoyed this bread cold out of the refrigerator! Enjoy! Lemon and zucchini is such a fabulous combination… And obviously that glaze doesn’t hurt at all! Oh, how I love lemon. It isn’t safe for me to make lemon treats because I am the only one here that likes it. Never thought about lemon and zucchini. Looks yummy! This looks so yummy. Is is necessary to squeeze the liquid out of the zucchini? Not if you’re using fresh zucchini. If you’re using shredded FROZEN zucchini, then yes, I would squeeze out some of the excess liquid. How do you shred the zucchini? Do you squeeze the liquid from the zucchini? How? I use a food processor with a shredding attachment. You can also just use a cheese grater! And no, I don’t squeeze the liquid if it’s a fresh zucchini. If I’ve frozen the shredded zucchini, then yes, I would squeeze out some of the excess liquid. Hope that helps! Have you ever added nuts? Do you peel the zucchini first?